In the 1950s, the ATAS expanded the Emmys into a national event, presenting the awards to shows aired nationwide on broadcast television. In 1955, the National Academy of Television Arts and Sciences (NATAS) was formed in New York City as a sister organization to serve members on the East Coast, and help to also supervise the Emmys. The NATAS also established regional chapters throughout the United States, with each one developing their own local Emmy awards show for local programming. The ATAS still however maintained its separate regional ceremony honoring local programming in the Los Angeles Area. Originally there was only one Emmy Awards ceremony held per year to honor shows nationally broadcast in the United States. In 1974, the first Daytime Emmy Awards ceremony was held to specifically honor achievement in national daytime programming. Other area-specific Emmy Awards ceremonies soon followed. Also, the International Emmy Awards, honoring television programs produced and initially aired outside the U.S., was established in the early 1970s. Meanwhile, all Emmys awarded prior to the emergence of these separate, area-specific ceremonies are listed along with the Primetime Emmy Awards in the ATAS's official records. With the rise of cable television in the 1980s, cable programs first became eligible for the Primetime Emmys in 1988 and the Daytime Emmys in 1989. In 2011, the ABC Television Network cancelled the soap operas All My Children and One Life to Live and sold the two shows' licensing rights to the production company Prospect Park so they could be continued on web television; this prompted NATAS to create a new Daytime Emmys category for the 2013 ceremony to honor such web-only series. The ATAS also began accepting original online-only web television programs in 2013. Each Primetime Emmy statuette weighs six pounds, twelve-and-a-half ounces (3.08 kg), and is made of copper, nickel, silver and gold. The statue stands 15.5 inches (39 cm) tall with a base diameter of 7.5 inches (19 cm) and weight of 88 oz (2.5 kg). The Regional Emmy Award statuette is 11.5 inches (29 cm) tall with a base diameter of 5.5 inches (14 cm) and weight of 48 oz (1.4 kg). Each takes five and a half hours to make and is handled with white gloves to prevent fingerprints. 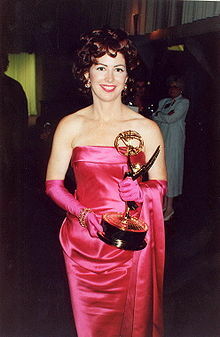 The Regional Emmy Awards are made by Society Awards, a New York-based company that also makes the Golden Globe Awards. The Primetime Emmy statues are manufactured by R.S. Owens & Company based out of Chicago, Illinois which was also charged with manufacturing the Academy Award statues until 2016 when AMPAS switched to Polich Tallix in Walden, NY.